The philosophy that guides Daniels - striving to make a safer environment for everyone involved in healthcare. Daniels' products and systems have been developed with extensive input and advice from healthcare workers around the world, including clinicians, safety and health personnel, infection control, health managers and support staff such as cleaners and orderlies. Daniels' primary focus is the reduction of sharps injuries through safer sharps management systems and practices. But Daniels' safety approach goes even further, taking into account other risks such as the potential for back injuries if collectors or accessories are too heavy or difficult to move. 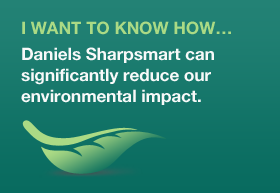 The effectiveness of the Daniels Sharpsmart system in reducing sharps injuries is achieved by focusing on three 'P's: The safest Product, correct Placement of sharps containers and thorough training of the People who use the system.